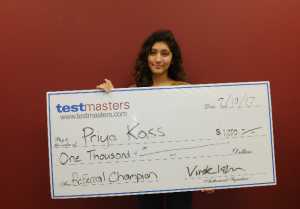 HOUSTON, TX (February 10, 2017) Priya Kass, a former student of Glenda Dawson High School and currently a University of Houston cougar, has qualified for Testmasters Referral Champion Bonus of $1000. Kass says that earning this referral champion bonus did not take much time or effort. “It only took a few minutes. I posted my coupon online on Retailmenot.com and a few other websites and everything else just happened!” Kass says that she started distributing her referral code at the beginning of her senior year of high school, meaning it took her only slightly over a year to earn this $1000 bonus. The Testmasters Referral Program allows former students to refer new students to Testmasters and earn a small profit in doing so. Former students who refer new students to Testmasters receive $25 per referral, and the student referred to Testmasters receives a $25 discount to the cost of their course. When a student refers 20 new students to Testmasters, that student will receive a $1000 Referral Champion Bonus. To that end, Kass is very involved in different activities and clubs on campus, including a medical volunteer organization and the Filipino Student Association.